Dave Sikula returns from the wild world of Ashland. 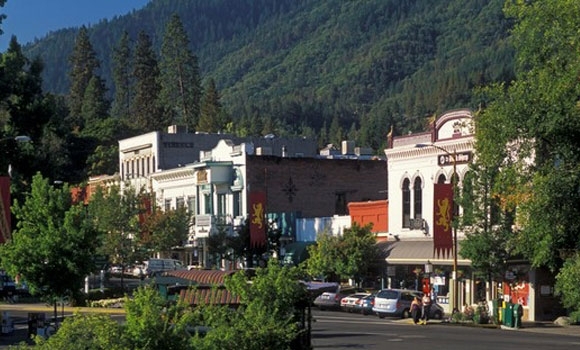 The wife and I recently returned from a trip to Ashland. Now, this does certainly not make us unique. I’d venture to say that a good portion of my constant readers (especially those in the Bay Area) have been there, and more than once. This trip was either my third or fifth (depending on how you count). I’ve seen shows there only three times, but auditioned there twice. (It obviously didn’t take – yet. I’m determined to go back, though.) It’s odd that I’ve been there only a few times. I went to grad school in Eugene, only a couple of hours north. I just never made the effort to see anything. There was no particular reason for this; I mean, I had no enmity against them. In fact, I had great respect for what they do, even (years and years and years ago – before some of you were even born, I’ll wager) sending them a copy of my translation of Chekhov’s The Three Sisters (getting a very encouraging letter from Jerry Turner, the then-Artistic Director). My experiences at Ashland have been hit-and-miss. A pretty good Hamlet (with a very good central performance), one of the worst Sea Gulls I’ve ever seen (which makes me kind of glad, in retrospect, that nothing ever came of my own translation. Remind me to talk about my theories about Chekhov sometime.) On this trip, though, we were four-for-four. We saw a very good and touching production of Water by the Spoonful, a fast-paced, lively – and actually funny – Comedy of Errors, the great Jack Willis giving a towering performance as Lyndon Johnson in The Great Society, and – the whole reason for going – a damn-near-perfect production of The Cocoanuts. 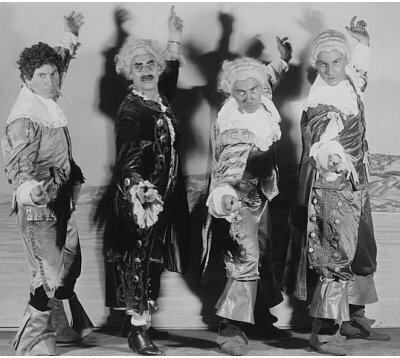 There are six and a half great Marx Brothers movies: the five they made for Paramount (The Cocoanuts, Animal Crackers, Monkey Business, Horse Feathers, and Duck Soup), and at MGM the first one (A Night at the Opera) and some of the second one (A Day at the Races). None of the other six are worthless (though The Big Store comes close), but, in Adamson’s words, “they were never in anything as wonderful as they were.” By the early ‘70s, I’d probably seen all of them with two exceptions: Animal Crackers (which was unavailable for legal reasons) and The Cocoanuts. In checking the TV Guide, though, I saw that, after years of waiting, it was finally going to be on. But, as scheduling would have it, it was going to be on in the middle of the afternoon on a school day. I have no memory of how I did it, but I somehow persuaded my mother to let me come home from school to watch it. I enjoyed the hell out of it (still do), and carry that memory fondly. By all accounts, the Marxes may have been just about the biggest stars on Broadway in the days when that was the epitome of show business. With a couple of movie-star exceptions (Chaplin and Pickford), you really couldn’t get much bigger. The thing about the brothers was that every performance was apparently barely-controlled chaos and unique from any other: one night Harpo arrived late, forgot to underdress for a quick change and ended up naked on stage; songwriter Harry Ruby marched on stage one night to demand that he be given the bathrobe he’d been promised as a birthday present; ad libs outnumbered actual lines (one night, playwright George S Kaufman was standing backstage and told the person he was talking to “Quiet. I think I just heard one of my original lines”). There was no telling exactly what would happen, but whatever it was would undoubtedly be hysterically funny. The script for both The Cocoanuts and Animal Crackers have been available for decades (I own them both), but it’s incredibly rare when someone does them – especially the former (most of Irving Berlin’s score was actually lost until the Ashland production). So when I saw they were doing Animal Crackers in Ashland, I figured I had to see it – and I ended up having one of the best evenings I’ve ever spent in the theatre. It was exactly what I wanted: full of chaos, spontaneity, ad libs, and inspired insanity. It was the next best thing to seeing the actual brothers on stage. And, on top of that, when it was announced that they’d be doing The Cocoanuts this season; well, there was no damn way I was going to miss it. Because of my commitments to Slaughterhouse Five, we were unable to head north until the end of October. Looking at the schedule, I saw that that would be the last week of the run – and the season – so I decided we had to see the final performance, figuring that, if any performance would go off the rails (in the best way), it’d be this one. It indeed did; it was just one of those performances where I had a big stupid grin on my face for nearly three hours, just drinking in the brilliance of the writing and performances. It was one of those rare times when I went into a show with the highest of expectations and hopes, and not only where they met, but everything went to 11. “The skies will all be blue/When my dreams come true” – and they did. The thing I most came away with from that weekend, though, was getting a sense of Ashland. It was the first extended period I’d spent in the town, and I could really see how it’s all focused on the festival (for good reason, but still …). Everything downtown seems to have some relation to what’s going on at the theatres; that the people in town have seen the productions and can talk about them intelligently; that the stores are doing more than selling books and tchotchkes that have a “Ye Olde” vibe. There’s a real sense of pride as to what the Festival means – and does – that I’ve never felt in another city, not even Stratford-Upon-Avon. It’s a real theatre-based town and economy that made me want to work there and become part of that experience. Now, I hasten to add, I don’t think these people are stupid or poorly educated – at least, in areas that don’t relate to the arts. It’s just that so many of our communities ignore the arts – performing and visual – that to say they ignore them is a vast minimization. They don’t know them in the way they don’t know what the best bakery in Montevideo is; it just doesn’t exist for them. That’s what was so exhilarating about being in Ashland. There was a sense that not only is everyone aware of, and pulling for, what’s happening with the Festival; it’s that it matters to them. And realizing that was simultaneously frustrating, sad – and inspiring. This entry was posted in It's A Suggestion Not A Review and tagged Ashland, Dave Sikula, George S. Kaufman, Irving Berlin, It's A Suggestion Not A Review, Shakespeare, The Marx Brothers.